In today’s generation, where people are obsessed with street foods that offer myriad of delectable food items that you can’t ever say no to, has made staying healthy a task. Once you realize what the food that is heavily induced with trans fat is doing to your body, you would want to cut right back on carbs and start eating healthy. But where to start? Adapting healthy eating habits seems to be a good place to begin. Millets are an excellent choice to replace your regular food with. They come in varying shapes and sizes, and each grain has its own health benefits. These whole grain millets are available in the markets at all times, and even throughout the year, as they are cultivated irrespective of the weather. 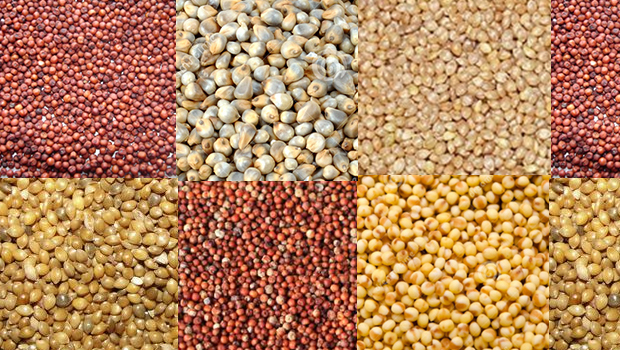 Other than people, millets are a major source of sustenance for birds and animals. Accommodating millets in your daily food routine can be benefitting in many ways. Non-glutinous acid free millets are a good source of nutrients such as copper, magnesium, phosphorus, and manganese. Which are excellent for maintaining a healthy life. A balanced diet full of nutritional properties will also help eradicate the risk of heart problems and other such life endangering diseases. When trying to lose weight, millets are viable a choice to a healthy weight reduction, as their calorie count is very low. Even for the people who are calorie conscious and trying to eat in a manner, that will help them maintain their energy levels throughout the day without constantly feeling famished. Weaker immunity can and will be fatal. The weaker the immune system, the more you are inclined towards experiencing health issues time and again. This is due to the serious deficit of protein in the system. Adding millets to your diet on a regular basis will help your body gain back all the protein, that your system was short on. Many carbohydrates such as rice and wheat are easy to breakdown once consumed, leaving a person hungry within few hours of their meal. This makes people resort to unhealthy eateries to satiate their hunger. Millets have harder structures and does not breakdown easily in the digestive system, keeping you far enough away from unhealthy eating habits. Due to its low glycemic index, millets are an ideal food to consume to preempt diabetes from ever occurring in non-diabetic people. It especially aids in keeping type-2 diabetes under control. Millets contain essential fats, just the right amount to give our body natural fat. This helps prevent excess fat from depositing over muscles which and avoid high cholesterol, heart strokes, and other heart related disease. Millets are the immediate best alternatives to replace with their unhealthy peers, reducing the risk of cardiovascular diseases by a good measure. Millet are the only grains that contain all the vital nutrients. From proteins to minerals to vitamins, millets have it all. Millets helps you switch to a lifestyle that’s healthy and long lasting.